Many motels and hotels in and near Charleston, West Virginia (WV), welcome guests through our hotel reservations and booking system. Other lodging accommodations near Charleston and elsewhere in Kanawha County, including hotels near South Charleston, West Virginia, may be found here and on similar pages. Charleston, WV, is located at the junction of I-77, I-79, and I64 in the Metro Valley Region in central West Virginia. The West Virginia capitol is located in the city. 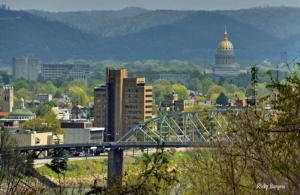 Charleston has long been a center for lodging and hospitality in west-central West Virginia. Many hotels, including the historic Daniel Boone Hotel, now a luxury office complex, gained great fame among travelers. The area boasts one of the highest concentrations in lodging accommodations in West Virginia. The Kanawha Valley region in general is renowned as a destination for outdoor-recreation vacations in and around Charleston and in the New River Gorge region to the east.